Our online Visitor Management system in the Employers Toolbox assists businesses with their Health & Safety obligations in keeping visitors to their site safe and informed with tracking them and educating them with your important policies upon entering. Knowing exactly who is at your work site and where they are at any given point is vital during an emergency situation or performing drills. The system has also been upgraded with a couple of new features. Following your feedback and suggestions we have introduced an optional 'Terms & Conditions' screen to the system. This new screen can be used to provide a notice to your visitors and contractors prior to them entering your premises. 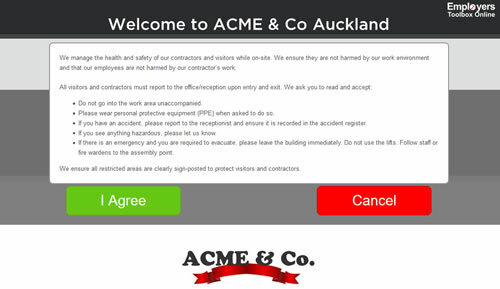 This functionality aims to inform visitors of your Health & Safety requirements or 'House rules' to be acknowledged before coming on site. This assists you under HSWA as the PCBU in your duty of care to inform and educate those entering your work site of their responsibilities and obligations. Security functionality has also been modified. There is no longer a managed 'timeout' period for the visitor portal. Previously the system would automatically log out after 9 hours, requiring administrators to log in again. This has now been removed, thus allowing visitors to use the system indefinitely. Thank you to all our clients who give us feedback and suggestions to enhance our systems. Insights from user experience is highly valuable to us and enables us to provide continual improvements. Enter your email address below and receive our free monthly Employers e-newsletter. NOTE: Get all of our products and unlimited phone legal support with our monthly support package. For only $70+gst per month.